Library of the Health Sciences, Room 320, 1750 W. Polk St.
Sleeve Caption The images included here are part of an ongoing series that seeks to explore and document where the city of Chicago meets the water. 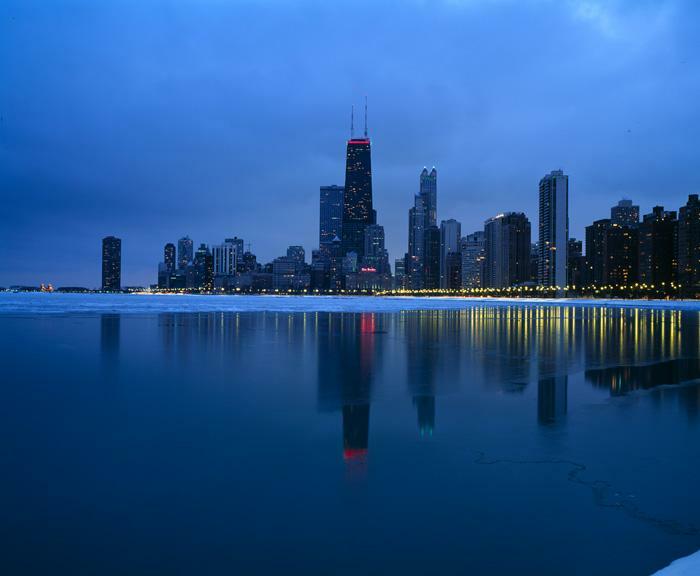 Over the course of the year, as the character of the lakefront evolves through the seasons, CITY 2000 photographer Alex Fradkin will capture a sense of this unique environment. Through this process, his photographs will reveal the rich diversity of moods and characters to be found along the lake, a place that in many ways reflects the City of Chicago. For several months each year, Chicago sees its most-loved natural feature turn into an otherworldly environment both beautiful and perilous. Lake Michigan, during the winter, transforms into something more like the arctic or a distant frozen planet than a Midwestern body of water. With each storm or temperature dip, new forms emerge and are shaped by pounding waves and shifting ice. Sponsorship Funded through the support of the Comer Foundation. Host University of Illinois at Chicago. Library. Citation Cite as [Creator]. [Title], [Identifier]. Comer Archive of Chicago in the Year 2000 (University of Illinois at Chicago).